This is the first ever Audi R8 rear wheel drive to be produced and will be available in both coupe and spyder body styles with production limited to just 999 units. For the true enthusiasts out there with some serious driving skills, Audi Sport has introduced the new Audi R8 RWS at the Frankfurt Motor Show. RWS stands for Rear Wheel Series and the latest addition to the supercar's line-up comes as special as it gets, since the model only gets rear wheel drive instead of the automaker's famed Quattro AWD system. The move, even if limited to a variant is seen as a major departure from the company's Quattro system that is seen as a part of the brand's identity. Audi Sport says the GT-spec R8 comes only I the rear wheel drive guise and the automaker is aiming to offer a more race car like experience on road with its newest offering. The new R8 RWS will be available in both Coupe and Spyder body styles with production limited to just 999 units. Power continues to come from the 5.2-litre naturally aspirated V10 engine that makes about 538 bhp and 540 Nm of peak torque. 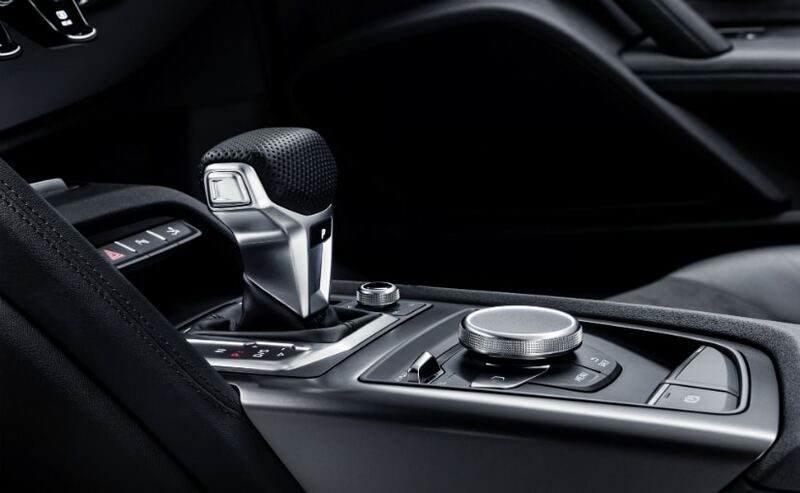 Power is transmitted to the rear wheels via Audi's 7-speed dual-clutch transmission. The figures remain the same as the AWD R8, but the RWS will be a lot more tail happy. More prominently, the rear wheel only layout has made way for weight savings and the supercar has lost up to 50 kg on the Coupe and about 40 kg on the droptop version. The R8 V10 RWS has a split of 40.6 front/59.4 rear weight distribution. With respect to performance figures, the Audi R8 RWS Coupe will sprint from 0-100 kmph in 3.7 seconds, around two tenths of a second more than the AWD version, while the R8 Spyder does the same in 3.8 seconds. Audi says the rear wheel R8 coupe will max out at 320 kmph, which comes down to 318 kmph on the convertible. The top speed remains same as the Quattro equipped derivatives. 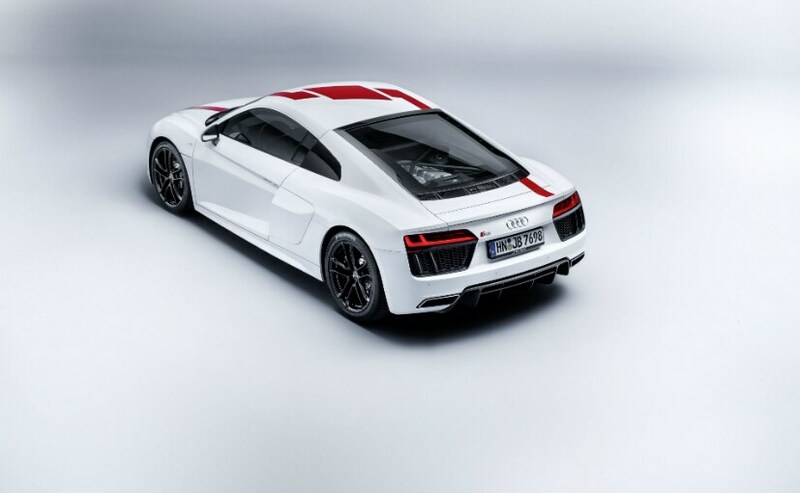 With respect to visual enhancements, the Audi R8 RWS gets the same design as the standard version. However, you do get additional matte black elements around the exterior, including the grille and the air intake. The upper sideblade is finished in gloss black. The supercar also gets red stripes similar to the one on the R8 LMS GT 4 and are available as optional. The RWD R8 gets black-finished 19-inch aluminum wheels in a five-spoke V-design with 245/35 section tires up front and 295/35 out back. Furthermore, Audi has tweaked the chassis and control systems for more responsive performance and, of course, more sideways action. The R8 RWS is priced at 140,000 Euros for the Coupe and 153,000 Euros for the Spyder, which makes it about 26,000 Euros cheaper than Quattro equipped version. 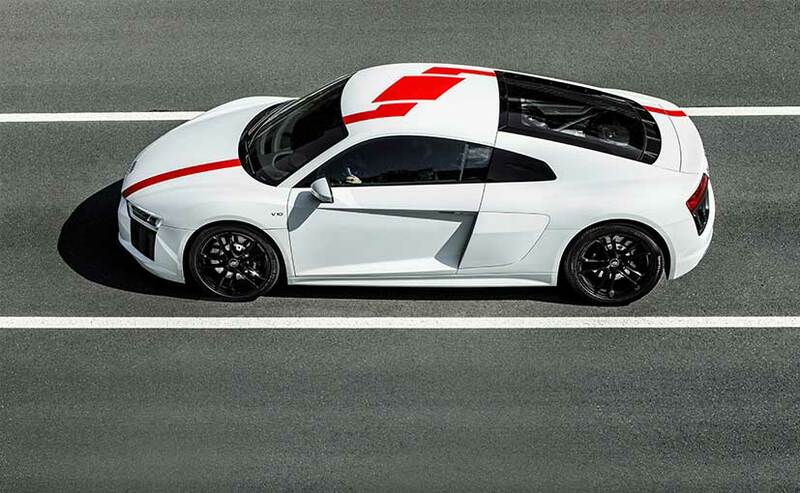 Audi Sport did more than just turn the R8 into a rear-wheel-drive machine as it also fiddled with the chassis and control systems to allow the driver have fun doing controlled drifts. That's one of the main reasons to go for the newly announced RWS model, right? Well, that and the lower starting price of €140,000 (Spyder is €153,000) in Germany, which is down by a significant €26,000 compared to the equivalent Quattro model. With production limited, it will be interesting to see how many units are allotted for India. So, yes, we do expect the rear wheel R8 to come to India sometime in the future.